The study of fatigue is of major engineering importance because cracks occur more frequently than expected. The goal of this research is to be able to better predict fatigue crack growth (FCG) in 2324 Aluminum Alloy. Being able to accurately determine FCG will help prevent disastrous failure of engineering structures. Through the experimentation of a varying stress intensity factor with a constant stress ratio and constant amplitude loading, a better understanding of FCG is anticipated. Due to time constraints, only the stress ratio of 0.1 was tested for this paper. However, the resulting data from the test was compared with previous data obtained from the exact same test setup, and it was found to be comparable. This is the start of additional load ratio predictions, which in turn will lead to the better prediction of FCG. Researchers are fervently conducting experiments to better predict fatigue crack growth (FCG) in aircraft aluminum. High strength materials, such as new Aluminum Alloys developed for the aerospace industry, have fairly low fracture toughness . Consequently, structural fatigue has become a major design issue in aviation, which is a matter of serious concern from a safety and economic standpoint . At times, cracks go undetected due to visibility constraints. However, upon repetitive application of stress, these cracks can grow and the structure eventually fails by this mechanism of fatigue. This has led to catastrophic failures like the infamous Aloha Airlines or Comet disasters. The ability to predict crack propagation is of extreme importance to researchers. Through the experimental investigation of FCG, the prevention of these tragic events will be achieved. This paper primarily focuses on the effect of a varying stress intensity factor while keeping the stress ratio constant during constant amplitude loading. 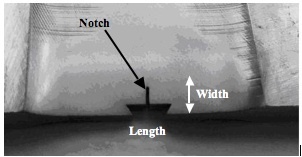 A manufactured notch or material defect can cause fatigue failure. Before crack propagation prediction can begin, it is necessary to understand the basic crack surface displacement modes by which a crack can extend . There are three basic modes of crack surface displacement. Mode I is the opening mode, which is most common, especially in fatigue. It consists of the crack faces moving apart. In Mode II, the sliding mode, the crack faces slide relative to one another in a direction normal to the leading edge of the crack. Mode III is the tearing mode, it also involves relative sliding of the crack faces, but now the direction is parallel to the leading edge . Mode I is caused by tension loading, while mode II and mode III are caused by shear loading in different directions. Nearly all attention has been directed towards Mode I because this is the predominant mode of macroscopic fatigue crack growth. Therefore, this will remain the primary focus of most fatigue researchers and of this paper. 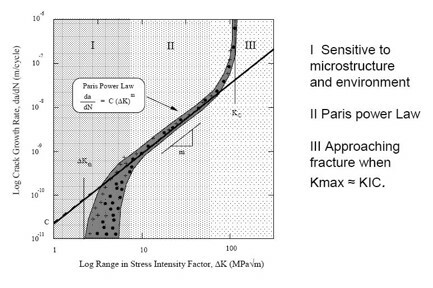 where Pmin and Pmax are the minimum and maximum loads, Kmin and Kmax are the minimum and maximum stress intensity factors, and σmin and σmax are the minimum and maximum applied stresses. The fatigue crack growth rate, da/dN, is defined as crack extension per cycle of loading. The relationship between da/dN and ΔK, shown later in this report, represents results for a given R at constant amplitude loading. In the past, several concepts have been developed to account for the R-ratio effect: crack closure, environment, residual compressive stresses, ΔK, and Kmax . However, the legitimacy of these methods is limited by the specimen type and the material being tested . It is also believed that the test methods may contribute to the R effect. In order to account for the R effect on the fatigue crack growth rate, many researchers have proposed different methods of experimentation. These methods are not yet universal because they are limited to certain testing conditions or materials . A residual stress is a tension or compression, which exists in the bulk of a material without application of an external load (applied force). Residual stresses are produced by heterogeneous plastic deformations, thermal contractions and phase transformations induced by the manufacturing process. Generally, compressive residual stresses have a beneficial effect on the fatigue life and stress corrosion because it delays crack initiation and propagation. Compression can allow reduction in the stress level of the points where the applied load is the highest. This leads to the apparent increase in the fatigue limit. When the total stress exceeds the actual yield strength, the material is plastically deformed. In the case of cyclic loading, cracks can initiate and propagate for a stress level much lower than the yield strength. This leads to redistribution, or relaxation of the residual stress. In other words, an accommodation of the structure to the applied load takes place . Fatigue crack closure has been deemed an important factor in determining crack growth rates, particularly in the near threshold region. This implies that the conditions in the wake of the crack and prior loading history can have a bearing on the current propagation rates . It is often found that oxide particles in aluminum cause crack opening, which is also known as crack closure. The oxide-induced crack closure forms when voluminous oxides form on crack surfaces . These oxide particles push the crack open because the oxide is harder than the aluminum. Oxide crack closure is significant near fatigue crack growth threshold where crack openings are small. The typical log-log plot of da/dN versus ΔK has a sigmoidal shape that can be divided into three major regions, as shown in Fig. 2. The first region is referred to as the "near threshold region". This region is controlled primarily by the mean stress and the microstructure. It indicates a threshold value, below which there is no observable crack growth. The second region is a linear region, which is known today as the Paris region. During this period, FCG corresponds to stable macroscopic crack growth typically controlled by the environment. In the third region, the FCG is very high as it approaches instability and point of fracture. There is little FCG life involved and it is primarily controlled by the fracture toughness. The region of the log-log plot of da/dN versus ΔK that is of most concern in this paper is the Paris region (region 2). This region describes the crack growth behavior using the relationship between cyclic crack growth rate, da/dN, and the stress intensity range, ΔK . As shown in Fig. 2, the first region represents a period of slow growth, the second region a period of stable growth, and the third region a period of rapid, unstable growth. In equation 1.2, C, the fatigue crack growth coefficient is a constant, and m', the fatigue crack growth exponent, is the slope on the log  log plot. The value of the exponent m' typically ranges from 2.0 to 7.0, with most values falling between 3.0 and 4.0 . FCG research aims to ensure the accuracy of results determined through laboratory testing and crack growth in engineering structures and components . Stress concentrators or notches are inevitable when it comes to manufacturing. These sites become hot spots for cracks to form, resulting in future fatigue failure . The objective of this research is to investigate the effect of varying ΔK with a constant R ratio in a constant amplitude loading test. A rectangular 2324 Aluminum Alloy specimen, 45 mm in width, 2.5 mm thick, and 125 mm long is machined so it contains a central notch and slit (Fig. 4). The notch acts as a stress concentrator (lower stress limit). Its dimensions are as follows: 4.5 mm in width and the length, not being of importance is neglected in this test (Fig. 5). The ends are engraved, so later on samples can be distinguished from each other. The specimens are then sanded on both sides, starting with 320-grit sandpaper, and increasing in increments of 100 until there are no visible ridges or crossing lines on the specimen. The specimen is then mechanically polished, again on both sides, using 1&mu;m diamond compound spray. The finished specimen should have a mirror finish. A rather simple design was used in order to complete the fatigue experimentation. The MTS 810 materials testing system was the primary component in the setup. Some secondary instruments that were also crucial to testing were a webcam and a translation stage. The translation stage used in this experiment was taken from a standard microscope. It is capable of moving a full 45 mm with 0.1&mu;m increments. The translation stage has the ability to move along the specimen vertically (y-direction) and horizontally (x-direction). It also has the ability to move towards and away from the specimen (z-direction). A camera and a standard webcam modified with a microscope were mounted to the translation stages so it can be moved to wherever the crack propagates. 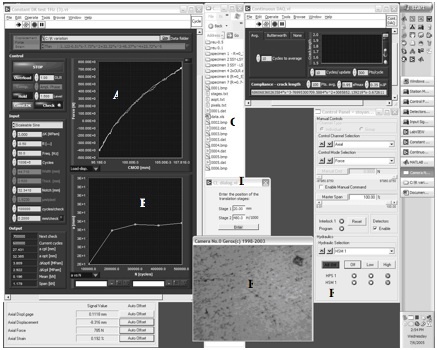 It is used in conjunction with MATLAB allowing pictures of the sample to be taken. At every checkpoint, LabVIEW and MATLAB automatically record data and capture images. A fatigue pre-crack is formed at a sharp, machined notch at a relatively low ΔK level to provide a sharp crack tip. A compressive load, the minimum to be -19 kN and the maximum to be -50 N, is applied to the specimen. The pre-crack should only be performed for a maximum of 100,000 cycles, with a maximum loading frequency of 50 Hz. Also, the final Kmax should not exceed the initial Kmax for which the test data is obtained. In order to perform the pre-cracking, the 810 Materials Testing Machine is used. A picture of the specimen before and after the pre-cracking is captured for future reference. Once the researcher has completed the pre-cracking, the notch and pre-crack lengths need to be calculated. In this experiment, both values were calculated using the captured pictures and MATLAB (refer to Appendix D). The calculated values are originally in inches and therefore, need to be converted to millimeters. Also, the calculated pre-crack length is multiplied by the constant 1.923 &mu;m/pixel from the camera resolution. The notch and pre-crack lengths are then added together, resulting in the total crack length from the edge of the specimen. Before the test is performed, an R-value needs to be pre-selected by the researcher. An R-value of 0.1 was used in this experiment. How the test is conducted depends on the setup of the individual MTS machine. In the Fatigue and Fracture Lab at Western Michigan University, the 810 MTS machine is controlled using a LabVIEW program written by Dr. Stoyan Stoychev (refer to Appendix C). During the test, LabVIEW records data at specific points, while a MATLAB program captures pictures. During the test, the cycle limit was one million, but was reduced to a mere 100 cycles depending on the crack growth rate. A frequency between 20 Hz and 50 Hz was used depending on the value of ΔK, the higher the ΔK the lower the frequency and vice versa. where F is the geometry function, S is the stress, and a is the crack length. (A more detailed solution can be found in Appendix A). The test was started at a low value of ΔK, for example ΔK = 2 MPa&radic;m, and run for a million cycles. At least 5 data points at each ΔK need to be taken in order to obtain an accurate analysis. This suggests that ΔK has increased by 0.2 MPa&radic;m, keeping it at a million cycles until the crack begins to propagate (a threshold is reached). Once propagation occurs, ΔK can be increased in increments of 1 MPa&radic;m. As the crack growth rate increased with increasing ΔK, the number of cycles drastically decreased, allowing for more accurate data to be obtained. If data points are collected to scarcely, or ΔK is increased or decreased too quickly, the data will be inaccurate. In fatigue crack growth curves, the crack length, a, is plotted versus the corresponding number of cycles, N, at which the crack was measured. A majority of the life of the component is spent while the crack length is relatively small. In Fig. 10-Fig. 12, both the optical and compliance crack lengths are plotted against the number of cycles to show the accuracy of the compliance calculations. The LabVIEW program used automatically calculates compliance during the test. This allows the user to compare the optical and compliance data. The user acquired the optical data, while compliance was calculated using load-displacement records. 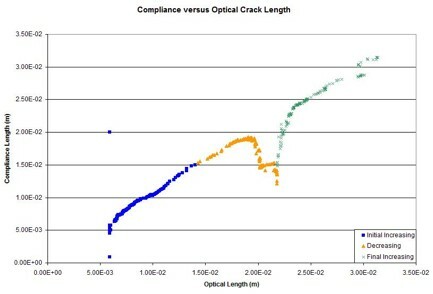 The relationship between the compliance and optical crack lengths, shown in Fig. 13, is supposed to be linear. However, the plotted results show otherwise. This nonlinear graph resulted from decreasing the load too quickly, resulting in crack closure. The crack growth rate also increases with applied stress. It is defined as crack extension per cycle, da/dN. Thus, the crack growth rate is obtained by taking the derivative of the above crack length versus cycle curve. Two generally accepted numerical approaches for obtaining this derivative are the line fitting method and the incremental polynomial method . Consider a growing crack in the presence of constant amplitude cyclic stress intensity. A cyclic plastic zone forms at the crack tip, and the growing crack leaves behind a plastic wake. If the plastic zone is sufficiently small that it is embedded within an elastic singularity zone, the conditions at the crack tip are uniquely defined by the current stress intensity value, K, and the crack growth rate is characterized by ΔK. Therefore, values of log da/dN can then be plotted versus log ΔK, for a given crack length, where ΔK is equal to the maximum stress intensity factor minus the minimum stress intensity factor due to the remote applied stress ΔS . The next relationship examined was between the applied load and ΔK. 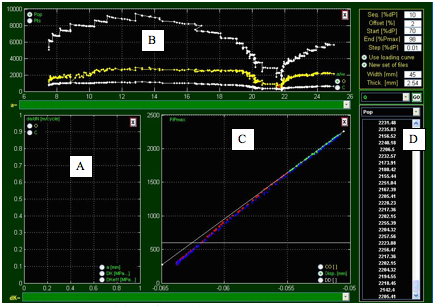 At the start of the test, a constant load amplitude ΔK increasing test was performed. This is a fatigue crack growth test that generates data typically above 10^-8 m/cycle. 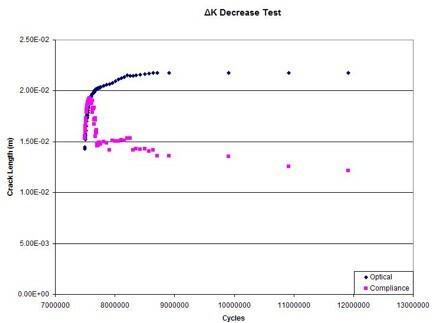 After the increasing test, a constant load amplitude ΔK decreasing test was performed, decreasing ΔK to the Kthreshold value. The forces correlated with the ΔK value. As the ΔK value decreased, the applied load also decreased. Lastly, a ΔK-increasing test was performed until fracture. 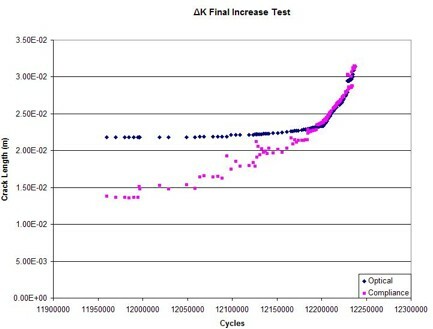 Again, during both ΔK-increasing tests, the forces increased with the increasing ΔK. The relationship between the load and the crack length was also examined. For most correlations, the optical crack length was used because the compliance crack length has been found to be less accurate. 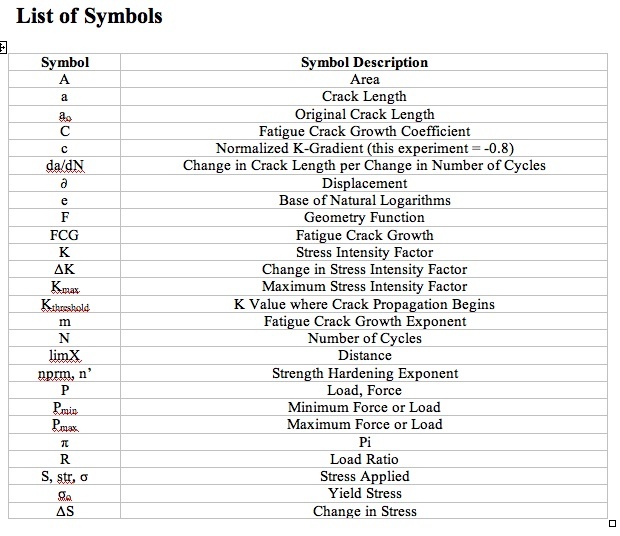 The load increases and decreases according to the type of ΔK test being performed. Overload can be seen during the start of the initial increase test. Some causes of overload in this region are due to the testing system. The few occasions where the test was stopped due to power failure, there was noticeable overload at the abrupt stop and start points. As shown in Fig. 15, the crack length steadily increases as the applied load undergoes constant increase or decrease. Points of overload can also be seen towards the end of the test. ΔK values of 14.8, 15.4, 16.7, 17.4, and 18.7 are all points of overload. The cause of the overload is uncertain, but it occurred after the initial Kmax value had been reached. The first K-increasing test that was performed had a range of ΔK values from 2.0 to 14.0. The final K-increasing test had a range of ΔK values from 3.0 to 18.0. The overload occurred when the value of ΔK was increased to the next value. It also occurred at the point of fracture, which is normal. The load  displacement records collected during the test were examined using a MATLAB program written by Dr. Stoychev. Through this program the load versus optical crack length or even displacement versus load (max load) can be plotted. The program also outputs the maximum and minimum loads, along with optical versus compliance measurements. It is a useful tool when analyzing the validity of data points and locating points of overload. As shown in Fig. 17, Dr. Stoychev's data (faded lines) is very similar to those obtained by the current test (bold lines). The average increasing values fall right on Dr. Stoychev's acquired data while the decrease test is almost as accurate. Based on the research done in fatigue crack growth, several conclusions can be made. Firstly, overload occurs at several different points during the test for numerous reasons, some known, some not. The known reasons for overload are due to critical errors resulting from a power failure during the test, caused by either LabVIEW or the computer operating system. Overload also occurred when the value of ΔK was increased beyond a ΔK of 14.0. Secondly, decreasing the applied load too rapidly results in crack closure within the specimen. Finally, the test data matches results from previous testing, thus supporting the belief that crack closure can be deemed unimportant in this overload. Additional research is needed to investigate the relationship R has on ΔK. Researchers still need to investigate the effect of varying ΔK while also varying R. Originally, the study intended to include testing at R-values of -2.0, -1.0, 0.1, 0.3, 0.5, and 0.9. Due to lack of time, only the R-value of 0.1 was tested. With the experimentation of the effect of more R-values, the ability to predict other load ratios is anticipated. For better determination of the accuracy of the effects of the R-value, more testing is needed. 1. Dowling, N., Mechanical Behavior of Materials: Engineering Methods for Deformation, Fracture, and Fatigue. Prentice Hall, Upper Saddle River, NJ, p. 357-550. 2. Forsyth, P.J.E., "Fatigue Problems in Service: Aircraft Structures". Metal Science. Vol. 11. 1977, p. 293-302. 3. Stephens, R., Fatemi, A., Stephens, R., Fuchs, H. Metal Fatigue in Engineering. John Wiley and Sons, Inc., NY, 2001, second addition. pp. 136-147. 4. Kujawski1, D., "A new (ΔK+Kmax)0.5 driving force parameter for crack growth in aluminum alloys." International Journal of Fatigue, Vol.23. 2001, pp. 733-740. 5. Kujawski2, D., "Enhanced model of partial crack closure for correlation of R-ratio effects in aluminum alloy." International Journal of Fatigue, Vol. 23. 2001, pp. 95-102. 6. Zheng, J., Powell, B., "Effect of stress ratio and test methods on fatigue crack growth rate for nickel based superalloy Udimet720." International Journal of Fatigue. Vol. 21. 1999, pp. 507-513. 7. Physique and Industrie, "Residual Stress Theory", [link=http://www.physiqueindustrie.com/residual_stress.htm] http://www.physiqueindustrie.com/residual_stress.htm[link], 07/11/2005. 8. Bailey, S., Baldini, N., McElrone, E., Peters, K., Rosiak, J., Annual Book of ASTM Standards: Metals Test Methods and Analytical Procedures. ASTM Publishing, 2004, Vol. 3.01, Sec. 3, pp. 627-653. 9. Newman, J., Piascik, R., "Interactions of plasticity and oxide crack closure mechanisms near the fatigue crack growth threshold". International Journal of Fatigue. Vol. 26. 2004. pp. 923-927. 10. Engrasp Inc., "Fatigue Crack Growth",http://www.engrasp.com/doc/etb/mod/fm1/paris/paris_help.html, 07/07/2005. 12. Hammouda, M., Osman, H., Sallam, H. (2004). "Mode I notch fatigue crack growth behaviour under constant amplitude loading and due to the application of a single tensile overload." International Journal of Fatigue, Vol. 26, pp. 183-192. 13. Olurin, O.B., McCullough, K.Y.G., Fleck, N.A., Ashby, N.F., "Fatigue Crack Propagation in Aluminum Alloy Foams". International Journal of Fatigue. Vol. 23. 2001, pp. 375-382. 15. MTS Systems Corporation, MTS, http://www.mts.com, 07/06/2005. 16. National Instruments Corporation, National Instruments  LabVIEW, www.ni.com/labview/, 07/06/2005. 17. Kazuyuki Kobayashi, VCAPG2 for MATLAB,http://www.ikko.k.hosei.ac.jp/~matlab/matkatuyo/vcapg2.htm, 07/12/05. This project was funded in part by the National Science Foundation (NSF) and the Department of Defense (DoD) Research Experiences for Undergraduates (REU) program (Grant # 0243608). Jennifer Mallory is an REU participant on this project. The continuing support of Western Michigan University is greatly appreciated. Thanks to Dr. Daniel Kujawski for the opportunity to participate within the REU program and for his helpful information throughout the project. Also, thanks to Dr. Stoyan Stoychev for his continuous guidance and source of knowledge, Kevin Braat for his guidance, and my family for their unyielding support. Oversight of anyone's work is unintentional, and sincerely regretted. In these equations, ΔP is the average force and Δ&del; is the average displacement. The 810 Materials Testing Machine (MTS) is capable of doing both compression and tension testing. It allows an operator to easily obtain information about the fracture mechanics properties of advanced materials, compression properties of composites, or perform other materials testing that is more traditional . National Instruments LabVIEW is the graphical development environment for creating flexible and scalable test, measurement, and control applications rapidly and at minimal cost. With LabVIEW, engineers and scientists interface with real  world signals, analyze data for meaningful information, and share results and applications. Regardless of experience, LabVIEW makes development fast and easy for users. Fig. 21 is a screen capture of the LabVIEW program, written by Dr. Stoychev, to run the 810 MTS. MATLAB is a high-level technical computing language and interactive environment for algorithm development, data visualization, data analysis, and numerical computation. Using MATLAB, you can solve technical computing problems faster than with traditional programming languages, such as C, C++, and FORTRAN. You can use MATLAB in a wide range of applications, including signal and image processing, communications, control design, test and measurement, financial modeling and analysis, and computational biology. Add-on toolboxes (collections of special-purpose MATLAB functions, available separately) extend the MATLAB environment to solve particular classes of problems in these application areas. MATLAB provides a number of features for documenting and sharing your work. You can integrate your MATLAB code with other languages and applications, and distribute your MATLAB algorithms and applications. 1. Vcapg2  VCAPG2 was created by Kazuyuki Kobayashi is a new version of MATLAB resident video capture program, which employs Microsoft's DirectShow libraries rather than the older Video for Windows (VfW) library. In order to run VCAPG2, you will need to install the DirectX runtime libraries. The vcapg2 requires a video capture device, such as a USB camera to be installed and working properly. This code has been developed and tested with DirectX 8.1 and 9.0 with MATLAB6.1/6.5. 2. image()  displays image object. It creates an image graphics object by interpreting each element in a matrix as an index into the figure's color map or directly as RGB values, depending on the data specified. 3. imwrite(A, filename, fmt)  write images to graphics file. Imwrite(A,filename,fmt) writes the image A to the file specified by filename in the format specified by fmt. A can be an M-by-N (grey scale image) or M-by-N-by-3 (color image) array. A cannot be an empty array. If the format specified is TIFF, imwrite can also accept an M-by-N-by-4 array containing color data that uses the CMYK color space. Filename is a string that specifies the name of the output file. Fmt can be any format supported by MATLAB. 4. imread(filename, fmt)  reads images from graphics file. It reads a grey scale or color image from the file specified by the string filename, where the string fmt specifies the format of the file. Imread returns the image data in the array A. If the file contains a grayscale image, A is a two-dimensional (M-by-N) array. If the file contains a color image, A is a three-dimensional (M-by-N-by-3) array. The class of the returned array depends on the data type used by the file format. 5. ginput()  Input data using the mouse. Ginput enables you to select points from the figure using the mouse for cursor positioning. The figure must have focus before ginput receives input. [x,y] = ginput(n) enables you to select n points from the current axes and returns the x- and y-coordinates in the column vectors x and y, respectively. You can press the Return key to terminate the input before entering n points. [x,y] = ginput gathers an unlimited number of points until you press the Return key. [x,y,button] = ginput(...) returns the x-coordinates, the y-coordinates, and the button or key designation. Button is a vector of integers indicating which mouse buttons you pressed (1 for left, 2 for middle, 3 for right), or ASCII numbers indicating which keys on the keyboard you pressed. If you select points from multiple axes, the results you get are relative to those axes' coordinate systems.